I throw a lot of dinner parties, and think it would be monstrously fun to play this new "Donner Dinner Party" game after supper some rainy night this autumn. I definitely have enough weird geeky friends who might want to go along with this idea! "Who’s safe when there are cannibals hiding among you? That’s the question at the heart of this fast-paced game of social deduction in which cannibals and pioneers face off in a fight for survival. Set in the winter of 1846, players are members of the ill-fated Donner Party wagon train, stranded atop a mountain with no food. Who will avoid becoming tonight’s dinner and make it off the mountain alive? And who are the suspicious scoundrels hungry for human flesh? Rowdy, outrageous, and full of playful deception, this party game packs a delightfully wicked twist!" The game is meant for ages 12 and up. 4-10 players can play together. 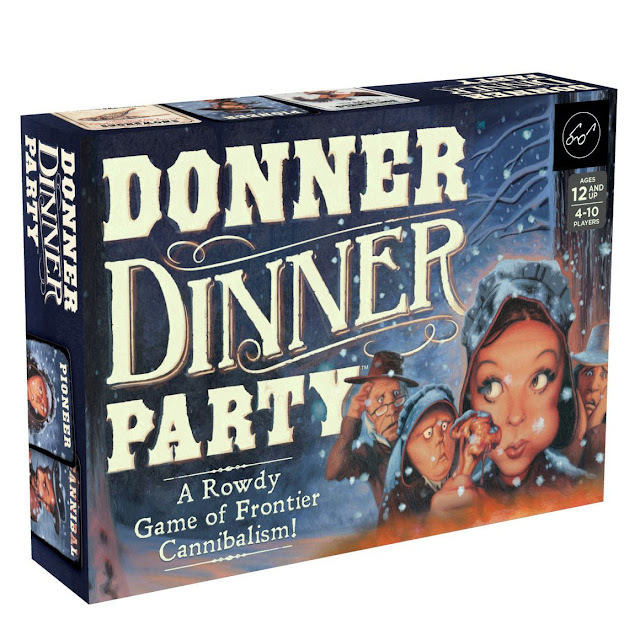 You can read a review of the Donner Dinner Party game at Gameosity and at GeekDad. Shop for the Donner Dinner Party game on Amazon and on eBay.